Do you run a nursing training organization or a nurse service center? Well, whatever it is unless you carry out an extensive advertising campaign, you won’t be able to reach out to the masses in this fiercely competitive world. But the good thing is you have various modes of advertisement today such as brochure, poster, flyer, bill board, rackcard and so on. 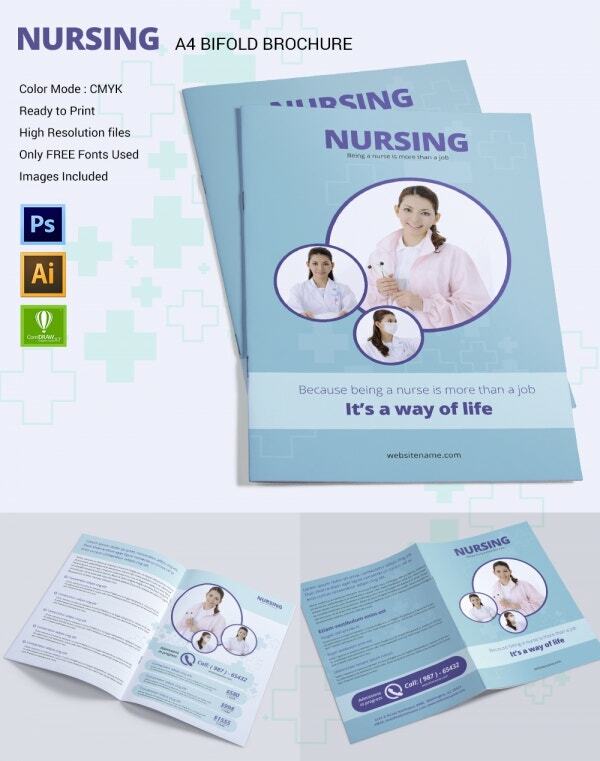 If you need ideas on how to design these, go for the readymade customizable nursing templates that are especially designed for the nursing organizations. You can also see Nursery Alphabet Letters. 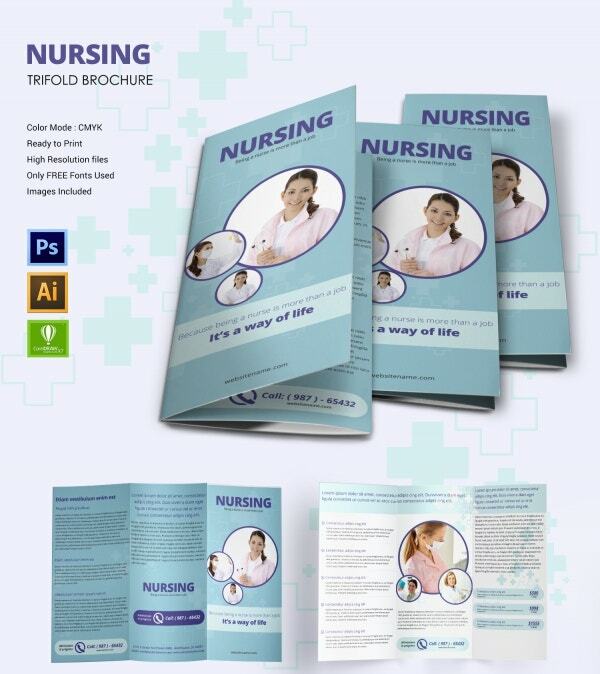 You have a professional nursing trifold brochure template here in soothing blue and white color combo. The front page looks minimalist yet elegant and allows pictures to do most of the talking. 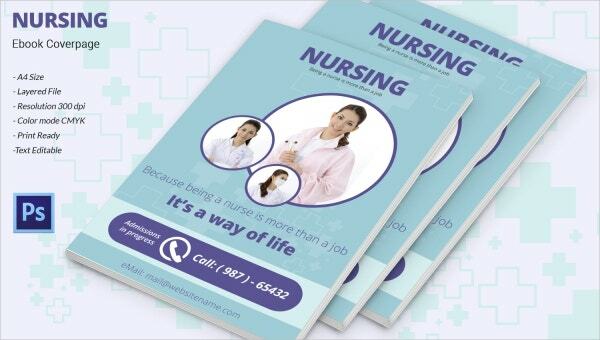 Inside you can enter elaborate text detailing about your nursing courses, certifications, experts and so on. You can also include your course package rates here. 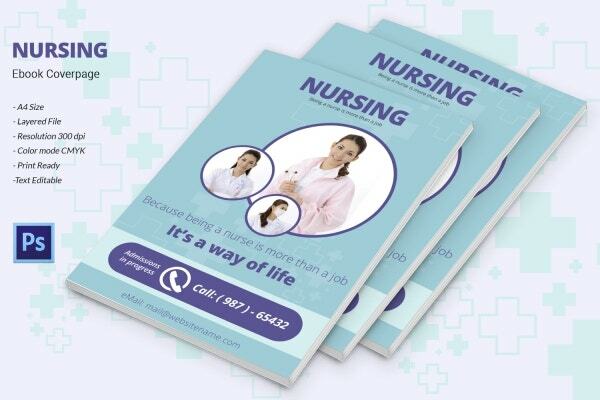 If you are looking for a bifold brochure for your nursing service center, this A4 bifold brochure template would be a great thing here. The cover page follows a simplistic approach where you can upload images and mention your slogan. The elaborate textual data are kept for the inside pages. 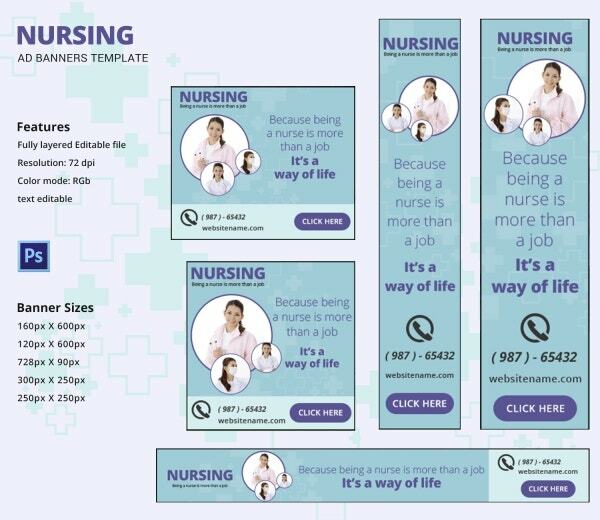 Are you planning banner ads for your nursing center? Well, in that case, you can anyday got for this brilliant collection of banner ad templates here that have come in 5 different sizes to choose from. All the templates enable you to advertise with images, your slogan and contact number. 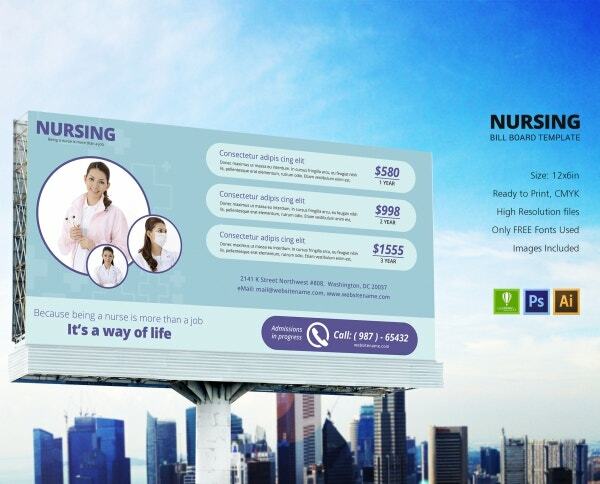 If you are looking for a huge exposure for your nursing training center, there cannot be a better option than this nursing center billboard ad template. The right side offers you ample space to detail about your course packages while your contact details can be placed at the footer of the billboard. 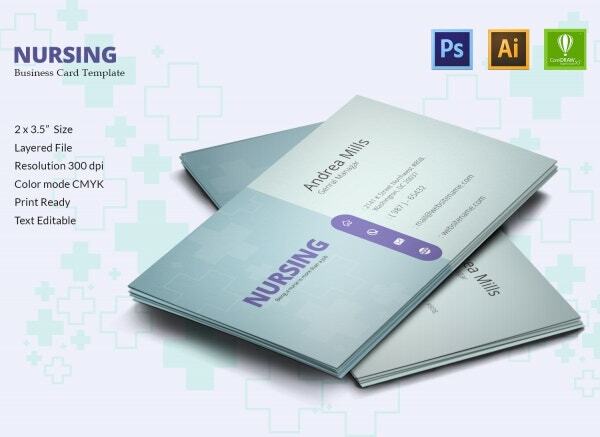 If you are looking to add a cool touch to your nurse business card, this simple yet stylish business card template is just the thing you need to go for. The most interesting part about the card is how the contact icons have been used as a divider and the cute icons have rendered an amusing quotient to the otherwise plain card. You have an A4 sized ebook cover page here which would be good if you are looking for some inspiration for your ebook cover. The cover page template looks refreshing with a light blue & white color scheme and it’s mostly donned by images. Below you can include your slogan and contact details. The envelope template looks professional with a formal and smart combo of violet, blue and white. The backside offers you sizeable space to note down the name of your nursing center, followed by your slogan. The envelope template also offers you adequate space at the bottom to jot down your phone number, address and website URL. 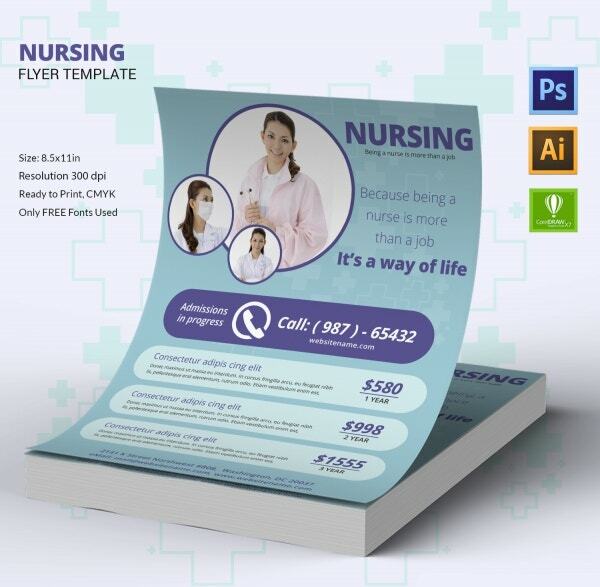 You have a simple yet practical flyer template here when you are looking for standard flyer design for your nursing center. 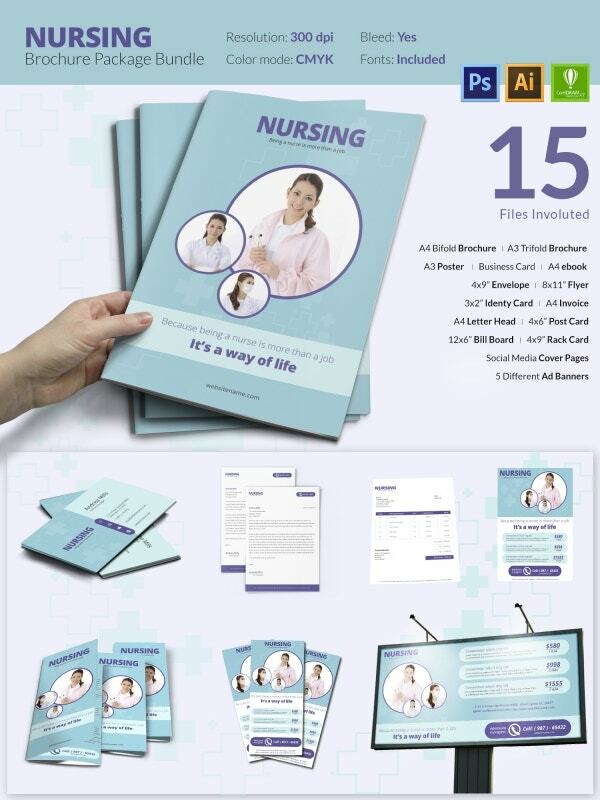 The template offers you good space to spread the word about your affordable nurse training course packages. The upper part of the flyer can sport the pictures of happy students from your institute. 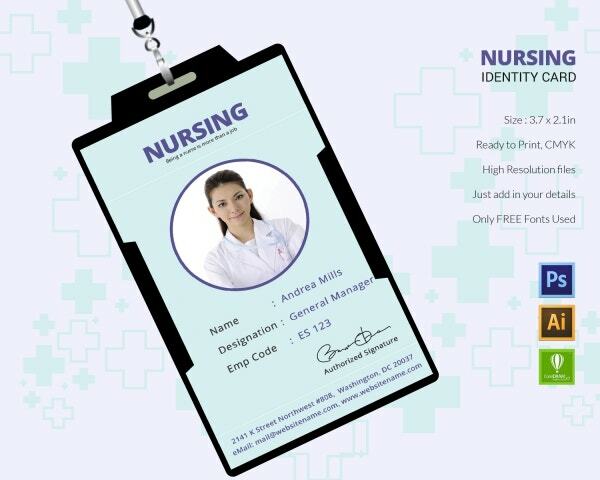 An ID card is a must have for the employees of any organization and the same rings true for your nursing center. If you are looking for a one for your organization, this template looks smart with its blue & white outlook. It starts with name of your center, the photo of the employee and her basic details like name, designation and employee code. 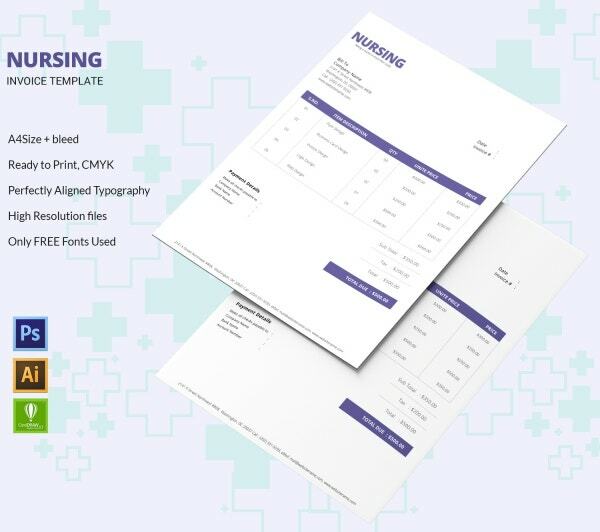 An invoice is customary when you are about to ask for payment for your nursing service and here you have the perfect invoice template for you. It embodies all the standard columns of an invoice such as item description, unit price, quantity, price and so on. There is a separate place for the payment details like bank name, account number etc. 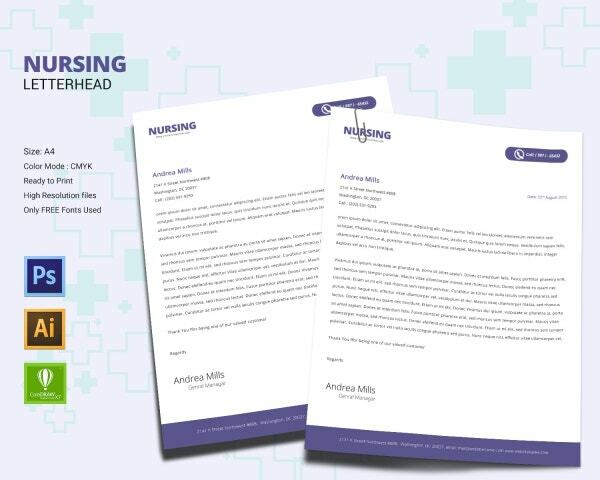 If you have been on the lookout of a professional letterhead for the official letters and declarations of your nursing center or training organization, this template would be a neat pick for you. It starts with your phone number on top right and then you get enough space for the textual document. Your additional contact details like address and website URL would be mentioned at the footer. 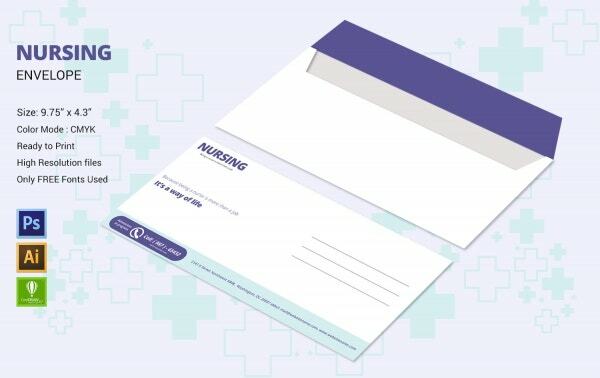 A postcard is a smart way to advertise your nursing center and you have a great nursing postcard template to help you here. 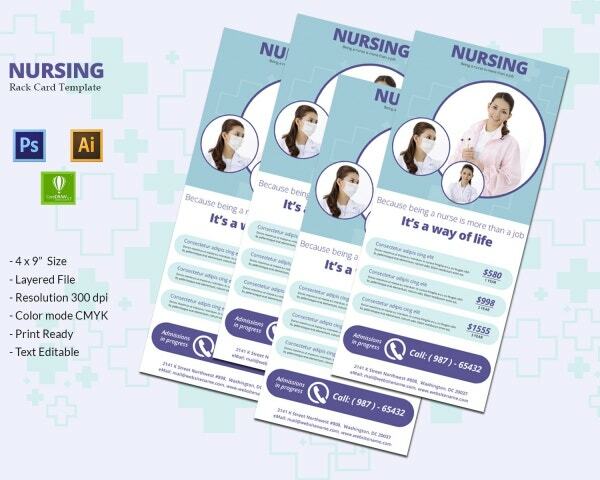 The front side of the postcard enables you to upload the images of your bright nurses along with text details of your service and slogan. The backside can be used for further information and your contact details. 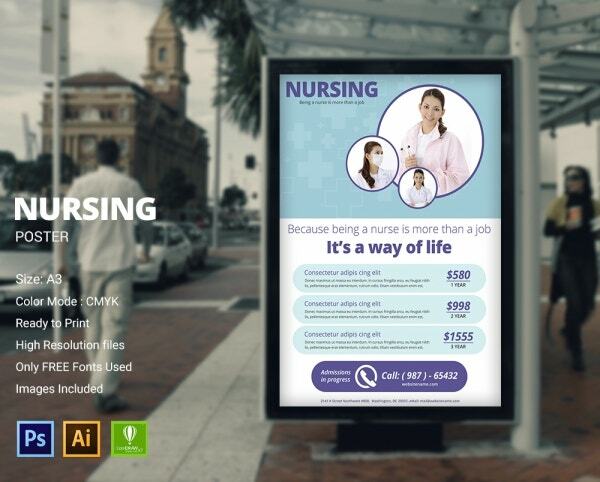 It would be really cool to advertise your nursing training organization in a chic poster format and thus have a great poster template here. It opens up with the happy faces of your brilliant nurses and below that you can mention about your course packages. The poster allows you to place your slogan and your contact details would be mentioned at the bottom of the poster. You have a very smart and functional rackcard template here in a 4 by 9” size. 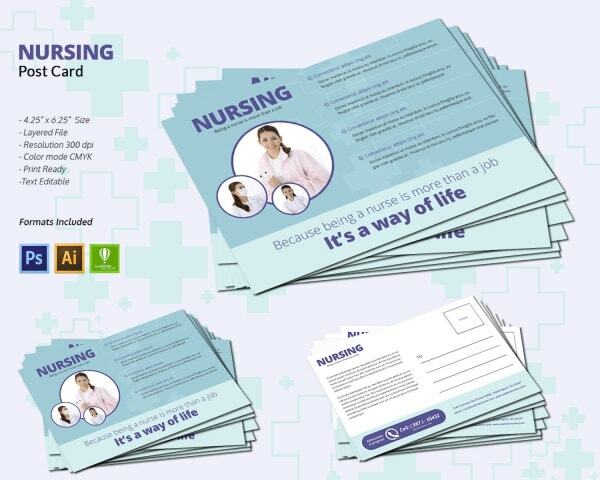 The rackcard looks practical with its sizeable space for all your nursing training course packages. You can include up to 3 courses here. Below you can include a CTA with the phone number of your training center. 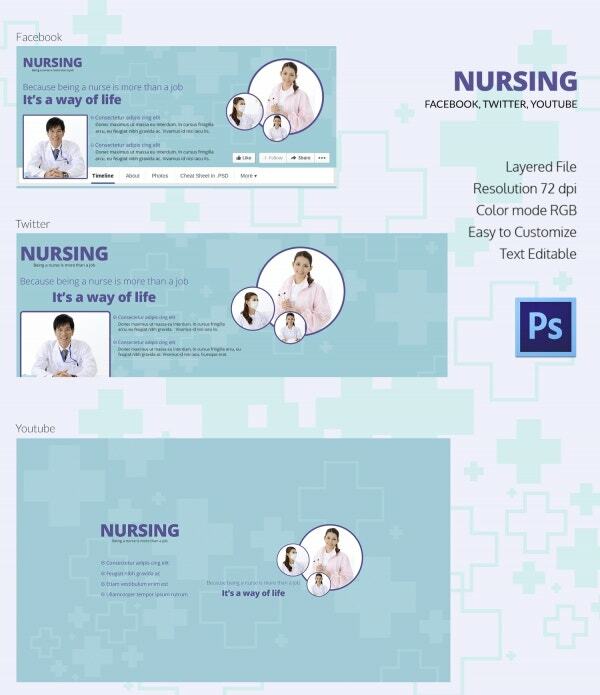 If you have plans to create a social media page for your nursing training center, here are 3 templates for you for Facebook, Twitter and YouTube cover page. All the templates allow you to upload your images and mention about the unique features of your organization. The facebook and Twitter page also allows you to offer a brief for each special feature.